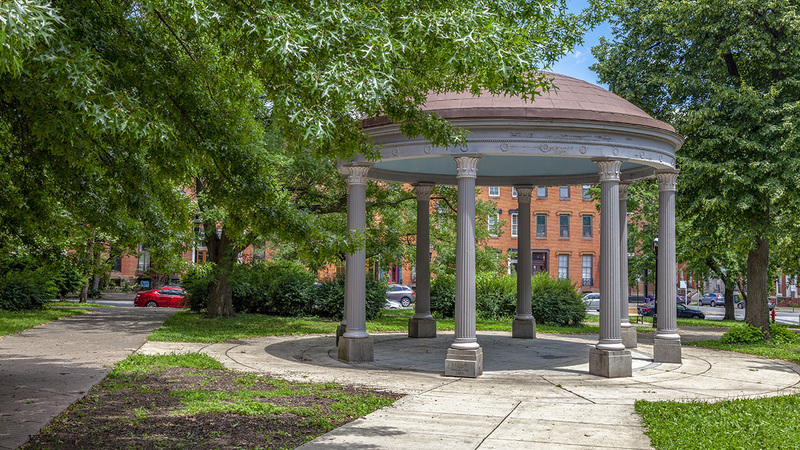 Located at the center of the Union Square-Hollins Market Historic District, this 2.5-acre public park was given to the City of Baltimore by John Donnell in 1840. 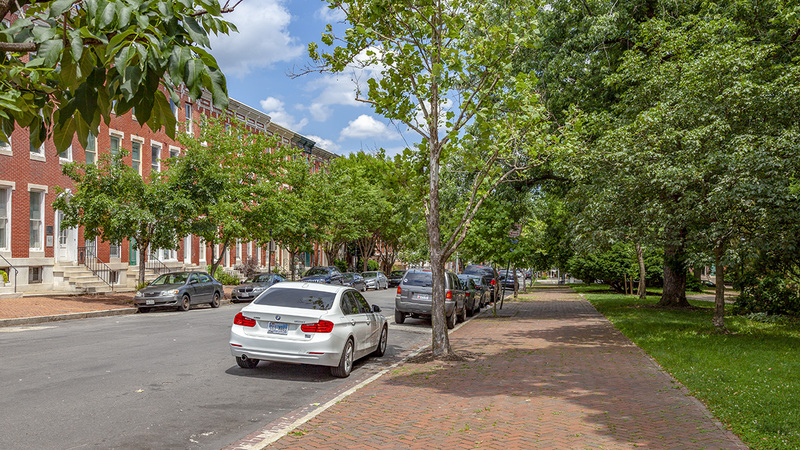 The Donnell family donated the parcel, which fully occupies one city block, for use as a park in hopes of raising the value of the surrounding real estate, which they owned. In 1852 a Greek-style pavilion designed by architect John Hoss and a bronze fountain designed by Malcom Harlow were added to the park, by then officially called Union Square. 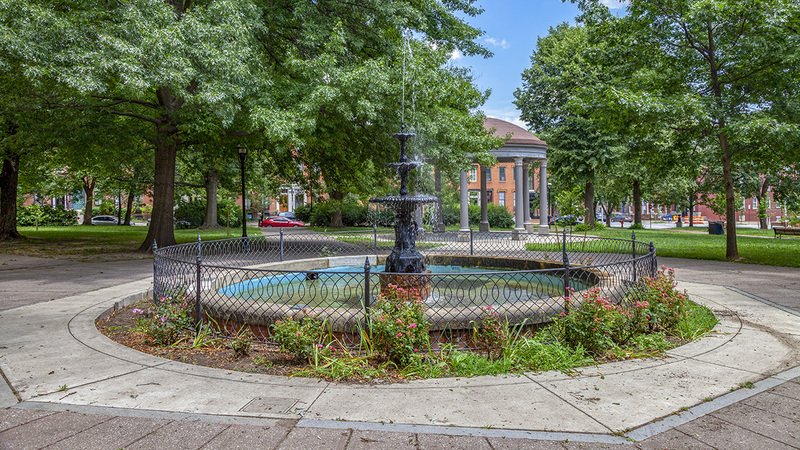 The fountain covered a natural spring that had previously supplied water to the Baltimore and Ohio Railroad. An ornate fence enclosing the park was also installed during this period but was removed in the 1870s. The creation of the square did indeed spur an increase in high-end residences in the area, with all lots adjacent to it sold by 1869. 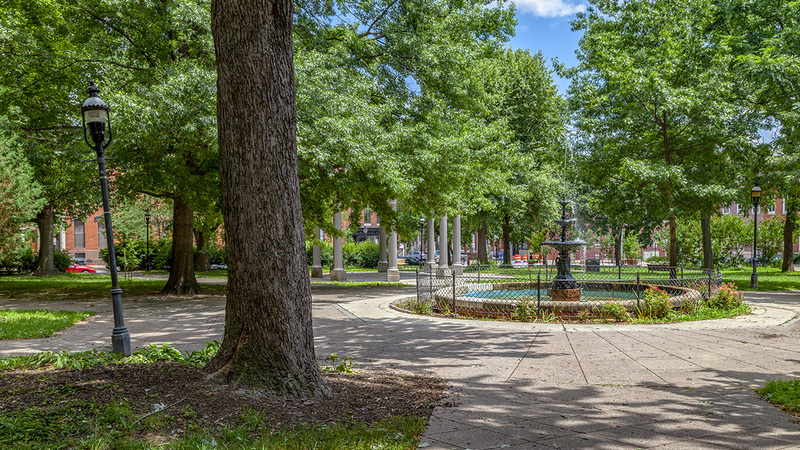 The park’s bronze fountain was melted down for munitions during World War II, replaced by a replica memorializing Baltimore writer H.L. Menken (whose home is on the north side of the square) in 1971. At this time, new sidewalks, benches, and walkways were also installed. The H. L. Mencken Memorial Fountain was replaced with another fountain in 2012. 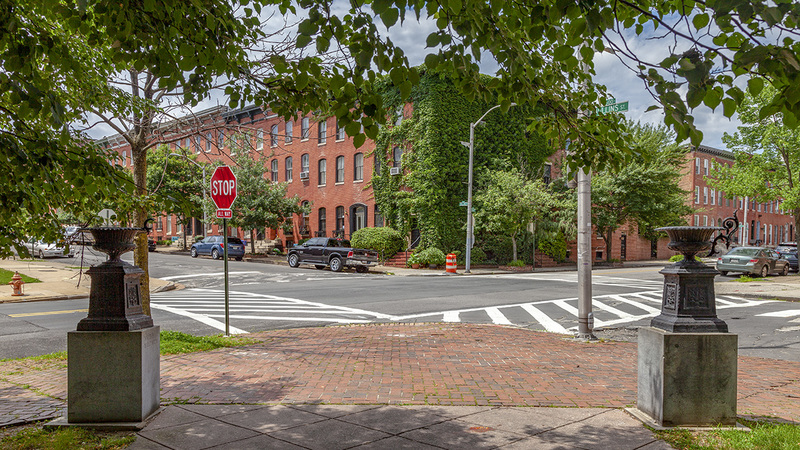 The square is framed by Lombard, Stricker, Gillmor, and Hollins Streets. 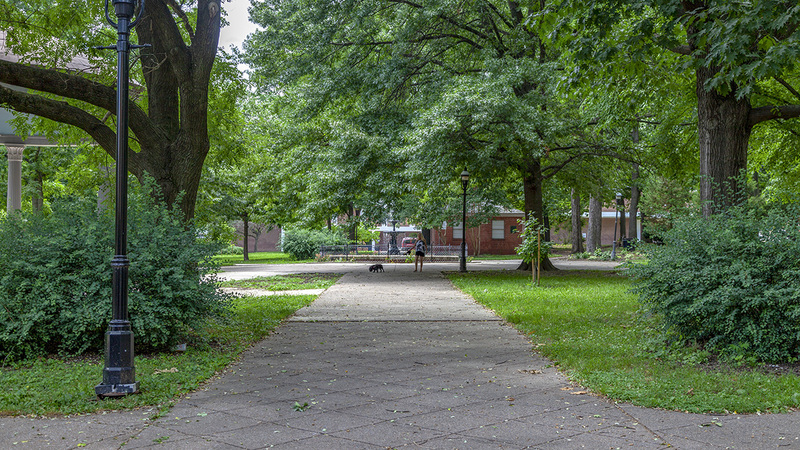 Sidewalks paved in brick with a herringbone pattern line the perimeter, leading past the park’s eight entrances located on the four corners and midway on each side. Each corner entrance is flanked by a pair of concrete pylons topped by ornate, cast-iron urns. Tile-patterned concrete pathways leading from the entrances converge on an ornate fountain at the center of the park. The three-tiered fountain sits within a marble basin, which is ringed with an iron fence and a planting bed. A Greek-style pavilion supported by eight fluted columns is located to the southeast of the fountain. 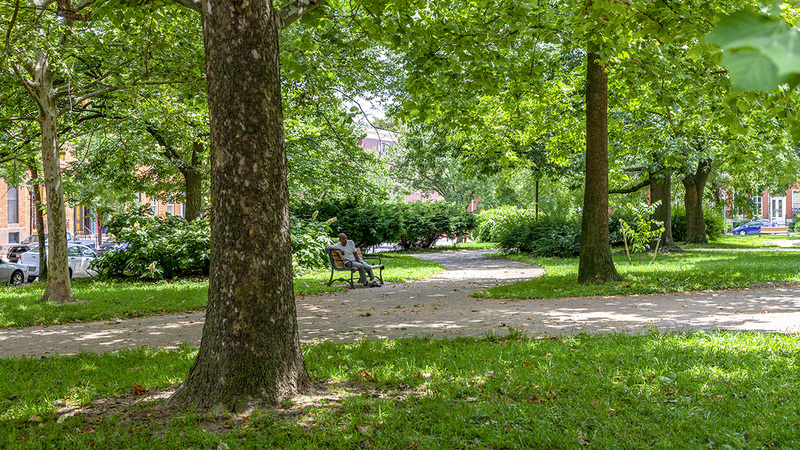 A dense tree canopy, including oaks and poplars, fills the square, lining its pathways and providing ample shade throughout the expanses of lawn. 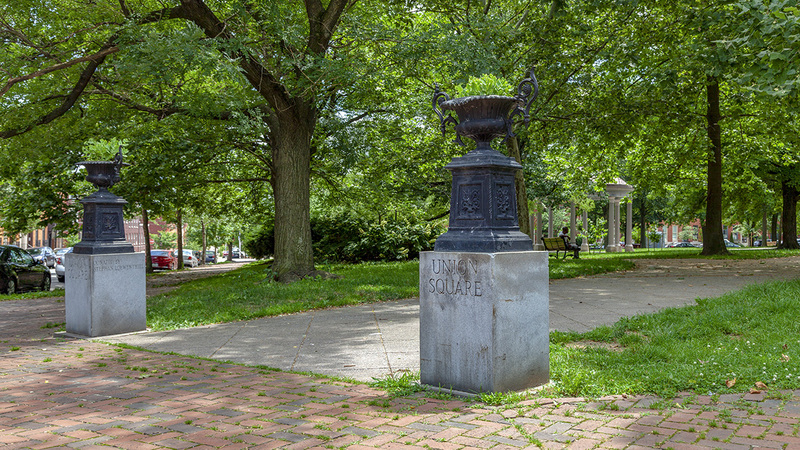 Union Square is a contributing feature of the Union Square-Hollins Market Historic District, listed in the National Register of Historic Places in 1981.